On July 15, while much of the planet was still recovering from World Cup fever, the news came from Dakar that Yandé Codou Sène, one of Senegal’s greatest traditional singers, had passed away. Known for her long association with the late President Léopold Sédar Senghor and for her commitment to Serere culture, Yandé Codou was 78 years old. In commemoration, I thought I would share a few tracks from her final cassette ‘Hommage a L.S. Senghor’, a 2003 release that was itself a tribute to her longtime patron. Yandé Codou Sène was born in 1932 in the small village of Somb, located in the middle of the Serere heartland, roughly 80km south of Dakar and 10km southeast of Diakhao, which was the first capital of the Siin kingdom. Born into a family of griots, Yandé Codou started singing in the late 1940s accompanying her mother Amadjïgene Gning to ritual ceremonies in neighboring villages. As the story goes, one day back in 1947, having accepted two invitations to perform for the same afternoon, Amadjïgene sent Yandé Codou to sing in her place in the village of Boof Poupouye. As the young initiates in the village prepared themselves for circumcision their spirits were lifted by the young Yandé Codou Sène’s surprisingly powerful voice, and the legend of the ‘voice of the Serere’ had begun. By the time she met Léopold Sédar Senghor a dozen or so years later, Yandé Codou had the confidence of a veteran performer. With the passing of the years this first meeting between the president and the griotte, which took place in the town of Gossas just before Senegalese independence, has become wrapped in a mystical shroud. The politician-poet, and future president, heard Yandé Codou sing at a traditional ceremony and was deeply moved by her voice. At some point during this event Senghor asked the young singer for a drink. Yandé Codou presented Senghor with a calabash of water. And once he had quenched his thirst, she dipped her hands into the calabash and washed her face with the remaining water, before sealing their fateful meeting by drinking the last drops. Throughout the 1960s and 1970s, especially in the Serere heartland, Yandé Codou was dispatched to work the crowd at most of Senghor’s political rallies, extolling his virtues and singing his praises before the President arrived. Her most famous melodies were in regular rotation on the national radio and one, in particular, was adopted as the theme of a popular program. Her loyalty and efforts were also rewarded with the house in the town of Gandiaye, located on the road between Fatick and Kaolack, where she would live for the rest of her life, and where she passed away last month. When President Senghor stepped down in 1980 Yandé’s national reputation soon dissipated, and for the next fifteen years she would perform mostly at Serere weddings and funerals. In 1995, Youssou N’Dour, whose father was Serere, resuscitated Yandé Codou’s career when he invited her into his Dakar studio to record a series of duos. Simultaneously released in Senegal and Europe, this CD introduced her to a new generation of fans and ultimately led to Yandé Codou’s first internationally released CD with her own group, 1997s ‘Night Sky in Sine Saloum’ released on the Shanachie label. After a few years of renewed attention, however, Yandé Codou returned once again to her schedule of ritual ceremonies in the villages around Gandiaye, appearing infrequently at the Theatre National Daniel Sorano in Dakar. Living modestly, and surrounded by her large family, Yandé Codou Sène passed away in the house that Senghor built for her a little before one in the afternoon on Thursday July 15, 2010. According to her wishes, she was buried in Somb. Yandé Codou Sène’s last release ‘Hommage à L.S. Senghor’ was recorded in 2003 in guitarist Jimi Mbaye’s Studio Dogo, located in the Nord Foire neighborhood of Dakar, not far from the Léopold Sédar Senghor international airport. She is accompanied by her regular ensemble featuring her daughter and musical successor Aïda Mbaye, her son ‘Commissaire’ Birama Mbaye leading the percussion section, and the popular Serere bandleader Mbaye Ndiaye on the Riti, a one-string fiddle. 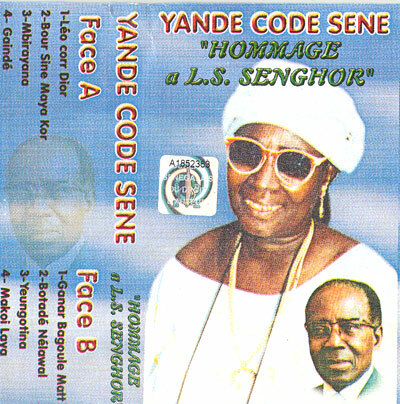 The eight songs on the cassette all pay tribute to Yandé Codou’s Presidential patron who had passed away in December 2001. The cassette opens with ‘Leo corr Dior’, a great example of the ‘A Kim No Kawoul’ or ‘Songs of the Griot’ that made Yandé famous. In this song, that she composed soon after he passed away, Yandé sings, ‘Léo you are the king of the Serere, you have come home to your family’. Singing to Senghor’s spirit in intimate terms-notice the use of the informal Léo, as opposed to the presidential Léopold-Yandé Codou continues, ‘You always said that you wanted to rejoin Philippe. Léo you have joined your family’. (Philippe Maguilien Senghor was Léopold’s only son, born to his second wife Colette Hubert. He died in a car accident in Dakar in 1981, and according to his wishes, Léopold Sédar was buried next to Philippe in Dakar). In ‘Mbirayana’, Yandé Codou uses a melody associated with circumcision rituals, called ‘kasak’, to again praise Senghor. She sings, ‘Our champion has fallen to the ground, our leader has left us’. ‘Botadé Nélawal’ is a praise song that Yandé Codou had composed for Senghor while he was still president. ‘You can sleep easy’, she sings, ‘because under your watch all is well. You have accomplished great things’. 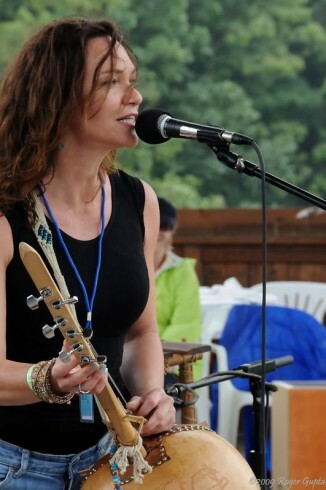 In this song she alternates between Wolof and Serere. This last track starts with a few verses of praise for Senghor before going on to sing the praises of one of the most famous Serere families. Throughout her career Yandé Codou not only sang Senghor’s praises but also lavished glory on the scions of the Siin region’s most noble families, the descendents of the rulers of the pre-colonial Siin and Saloum kingdoms. Up until her death, she always refused to allow her daughter to negotiate a payment before they performed for a noble family. According to her guiding values she could not put a price on the relationships that tied her as a griotte to the Siin’s royal lineages, and her noble patrons were in turn expected to demonstrate that they appreciated the true value of Yandé Codou Sène’s art. In ‘Bour Sine Maya Kor’ Yandé Codou sings the praises of Maya Kor, the last king of the Siin who passed away in 1969. She also honors the Diouf family, who were always loyal to the king. Thanks to Babacar Diouf and Remi Dioh for their insights, memories of Yandé Codou Sène and help with translations. Merci pour la qualité de l’article sur la diva seereer. Yandé Codou SENE à toute sa vie chanté par devoir, par amitié et par fidélité. Elle fut aussi dépositaire d’un pan entier de l’Histoire du SINE et du SALOUM. Par ses composition elle a su transmettre les valeurs du monde Seereer à ces contemporains. Thanks for this new treasure, but only four songs,is a little taste.